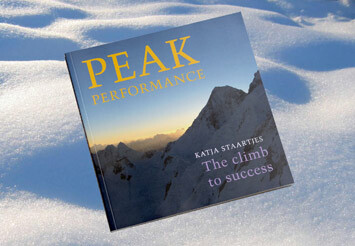 We are pleased to send you a signed copy of the book Peak Performance. Additional postage cost = € 0,- in Holland / € 5,- rest of Europe (EU) / € 10,- rest of the world. 1. Fill in the form and click ‘Send’. 2. Transfer the correct amount of money including postage to ING-bank (PO Box 1800, Amsterdam), IBAN: NL42 INGB 0008 0761 63 (BIC = INGBNL2A) at the name of Katja Staartjes Inspiratie, Koerselmansweg 6, 7435 PH Okkenbroek, The Netherlands. 3. After we have received the payment, the book(s) will be send.